And so it came to pass, we turned north to retrace our steps and return to Lescouet-Gouarec en route to the ferry, which essentially meant a continuously uphill and lumpy 90 km. But we had booked two nights avec le diner and, on the first night, some great company with a French family from Rennes with whom we passed the meal entirely speaking a mixture of English, crap French (us) and mostly Franglais (everyone). 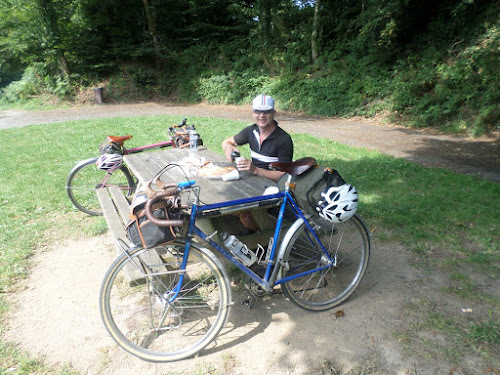 The usual round of riverside picnics thereafter – shall I post yet another picture of ‘le vin, la fromage et la pain’. . . yes, go on, why not . . . The journey onwards from L-G to took us back up the voie verte where we encountered these enormous mushrooms . . . 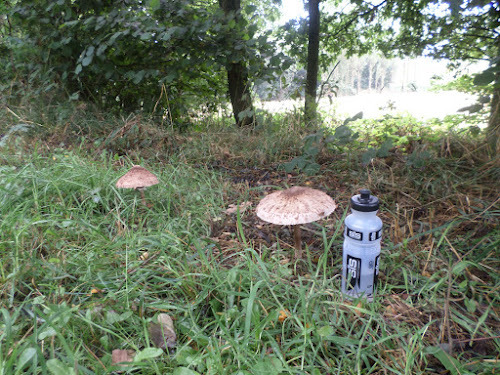 I did suggest to S that these were edible mushrooms, but she was understandably sceptical given our last experience of fungal harvesting some twenty-odd years ago, where my foolproof (and entirely scientific, I assured S) method of identification entailed waiting for her to eat them first and then observing the outcome . . . So, we left them, which was probably just as well because it seems that I had been inadverdently remiss in taking this photo while not leaving some sort of token, such as a silver sixpence or piece of cake; because later it was apparent that these very fungi were home to one of the denizens of the magical kingdoms, in this case the puncture fairy . 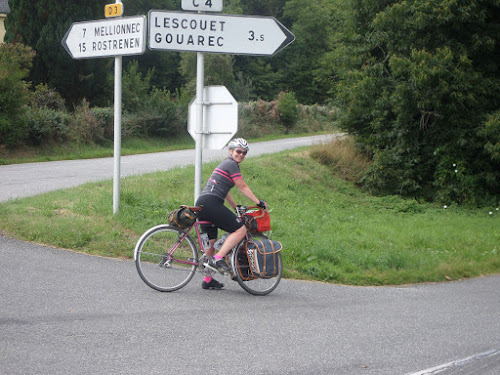 . .
You would think, after all these years riding the length and breadth of France, that S would have learned to repair a puncture? But apparentley, like putting up shelves or fixing the guttering while swaying at the top of an overextended ladder, it is one of those things destined to remain solely within my personal ambit . . .